Prime Minister Narendra Modi and his Israeli counterpart Benjamin Netanyahu are set to inaugurate a centre for entrepreneurship and technology in Ahmedabad today. Dubbed as the International Centre for Entrepreneurship and Technology (iCreate), the institution aims to identify, nurture and mentors aspiring entrepreneurs. A public-private partnership (PPP) venture of the Government of Gujarat, iCreate will also offer startups and entrepreneurs access to funding, space and other facilities. The entrepreneurship centre will be led by CEO Anupam Jalote, who has previously worked for telecom giants like Escotel (Idea), VSNL and Airtel. As part of the inauguration, winners of the bilateral innovation challenge that commenced in September 2017 will be announced and awarded. To that end, the two Prime Ministers will honour 38 startups – 18 from India and 20 from Israel – that are developing innovation solutions in areas of water, agriculture and medicine. In addition to receiving funding from both governments, the winners of the challenge will get to spend time exploring the startup ecosystems in India and Israel. Furthermore, over the next three days, PM Narendra Modi and Benjamin Netanyahu will be looking at some of Gujarat’s leading startups as well as their products at the upcoming startup fair. The inception of iCreate dates back to when PM Modi visited Israel as Gujarat Chief Minister. At the time, he was inspired by the West Asian nation’s robust policy framework on entrepreneurship. As stated by Amin, iCreate has been working closely with Israel for quite some time now, in a bid to further bolster the India-Israel Innovation Bridge. Launched in July 2017, India-Israel Innovation Bridge is currently managed by Invest India on behalf of the Government of India’s Department of Industrial Policy and Promotion (DIPP) and the Israel Innovation Authority. The new entrepreneurship centre, according to Amin, will facilitate this Bridge by hosting startups from both countries, particularly those working on innovation solutions in the areas of water, agriculture and medical devices. Coinciding with Israeli Prime Minister Benjamin Netanyahu’s visit to India, NASSCOM in partnership with Indiaspora recently organised the Tech Triangle Summit, in a bid to strengthen the trilateral ties between India, Israel and the US for innovation and entrepreneurship. The summit, which was aimed at celebrating the growing collaboration and cooperation between the three nations, also saw a $50 Mn trilateral fund being launched by Israel-India Technology Group, in order to business opportunities in the three countries. Additionally, the India Israel Business Innovation Forum also kicked off on January 15 to take the collaboration between the two countries further. The event saw one of the largest business delegations ever from Israel to participate in an event in India. Over 100 delegates from 74 Israeli companies from various industry sectors such as water, agriculture, foodtech, cybersecurity, homeland security, defense, software, IT and others have joined the forum. 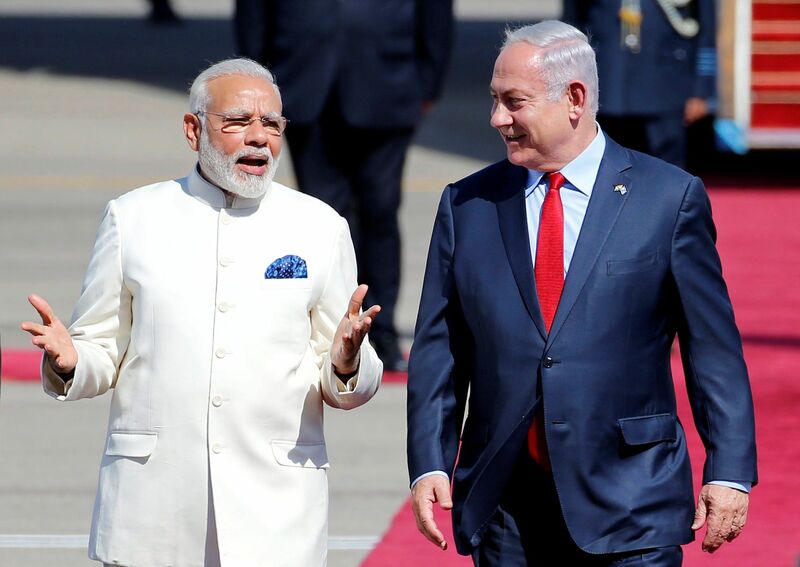 Last year, in July, during a three-day trip to Israel, Prime Minister Narendra Modi launched a five-year technology fund – The Israel India Innovation Initiative Fund (I4F), with the aim of growing the business relationship between both countries. As part of the same trip, India and Israel joined hands to announce a bilateral innovation challenge for startups in Israel and India – India Israel Innovation Bridge. Also, both countries signed a Memorandum of Understanding (MoU) to set up a $40 Mn Industrial Research and Development (R&D) and Technical Innovation Fund. By launching the iCreate entrepreneurship centre in Ahmedabad today, PM Narendra Modi and his Israeli counterpart Benjamin Netanyahu are likely looking to further strengthen ties between India and Israel.